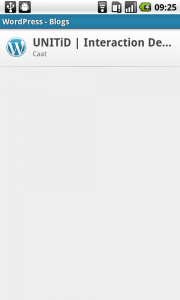 The options menu slides into the screen, and the ‘Add account’ option is tapped. The user enters username and password, and taps the ‘Sign in’ button. 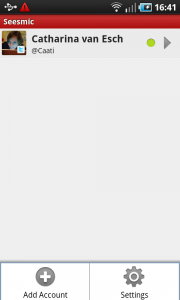 … and when done added to the list of accounts. A toast message confirms that the account has been added. 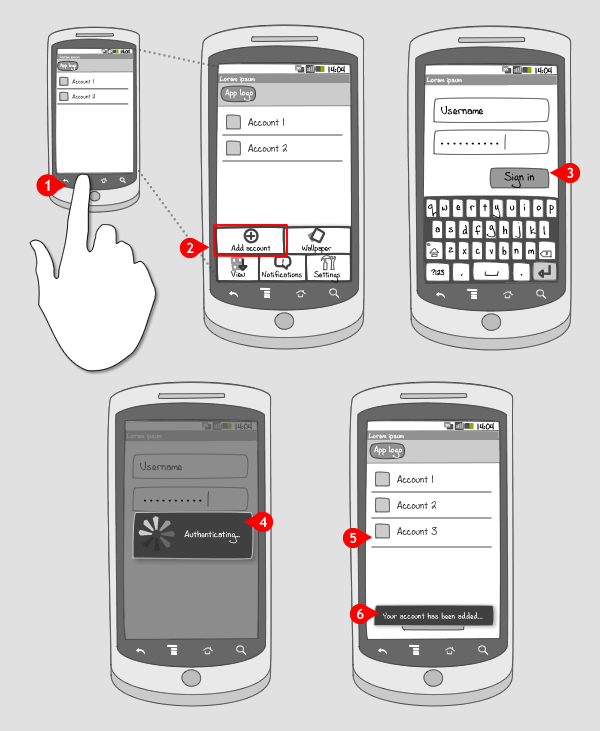 The option to add an account has to be applied in apps that can handle multiple accounts. Instead of signing out, and logging in with an other username and password, two or more accounts can exist next to each other. The user should also be able to switch between those accounts and create or remove accounts. 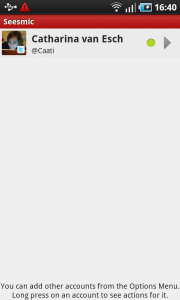 When it is not important to have the option to add an account somewhere in the screen using a dedicated button, you should put it in the options menu. You can also think of putting the options both in the screen and in the options menu. 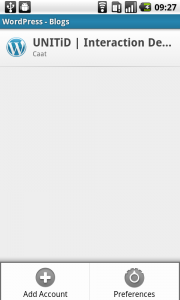 1 Seesmic's previous build shows a Twitter account that is signed in. 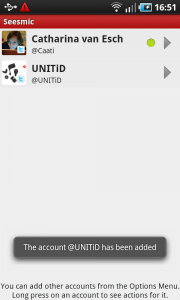 At the bottom a text explaines that the user can add an account using the options menu. 2 When the menu hard key is pressed, the options menu slides into the screen. 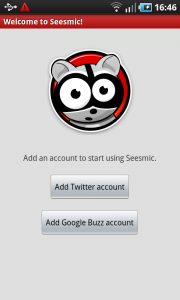 3 The user has to choose to add a Twitter or a Google Buzz account. 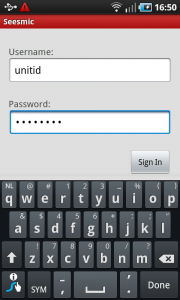 4 Username and password are entered and the button to sign in can be tapped to continue. 5 A toast message confirms that the account has been added. 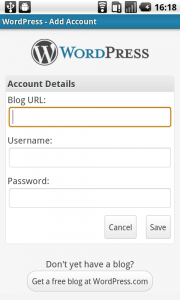 1 When an account has already been added to the Wordpress app, the openening screen shows it in a list. 2 To add an account now, unlike the situation when no account is signed in yet, the user has to press the menu button to call for the options menu. 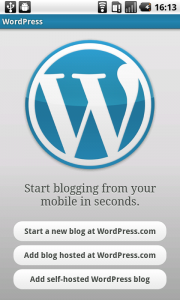 3 Upon selecting to add an account, a choice has to be made between a blog hosted at Wordpress, or a self-hosted blog. 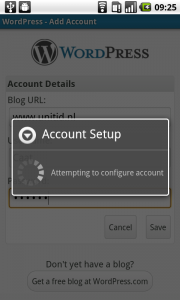 5 ... after which a progress dialog shows the account is being set up. 6 And when finished, the account has been added to the list.